Tuck and Cover is one of the hottest hairstyles right now. It is really easy to do and all you need is a stretchy headband. You can now watch the video tutorial and there are also three other versions of this look including the Tuck and Cover Half! See the others at the bottom of this post! Step 1: Begin by sliding on a stretchy headband to hold back the front part of your hair. Step 2: Next, place a second headband over the top of your head and slightly onto your forehead; this is what will hold the hair as it’s tucked. Step 3: Starting on the left side of the head, grab a 1-1 ½” inch section of hair and roll it up to the headband and tuck it into the band and pulling it tight so the ends stick out. Step 4: Then pick up a 1” section and combine it with the tail of the previously tucked strands and roll it up and into the headband. Again, pulling the strand tight and letting the tail stick out. Note: Pieces of hair will loosen and fall down. Just pull them back up and retuck them into the band pulling the ends tight. Step 5: Continue this method of adding in hair to the tails of the previously tucked strands until you’ve tucked in all the hair. Step 6: To finish, slide the hairband back slightly over your hair, like a headband, until it falls over the top of the first headband and hides it. *It can also be helpful to tuck in a strand on the right and then a strand on the left, working your way towards the middle of your head. Overall, all of your hair should be wrapped up and then tucked into the band. If any tails or flyaways slip out just wrap and retuck them. If any of them are too short to reach, hide them within the loops. Finish with hairspray. Also, this will work best on day two or three hair or with some added product that’ll give the hair some grip. If the hair is too “clean” it’ll easily slip out of the band. 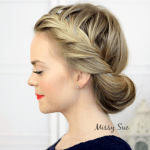 If you are new to MissySue, you will love the other versions of this hairstyle. I really love this hairstyle but I have one problem, when I but the headband on the top of my head it poofs my hair in a very unflattering way. Any ideas of tips for that problem? 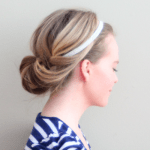 This style is cute and ridiculously easy!!! I shared with my readers here: http://seektobemerry.blogspot.com/2013/11/the-most-important-thing-to-prep-for.html Thanks for the inspiration! You could probably just use bobby pins or hairspray to secure the very last piece. I’m lost, are you tying a knot at some point? that looks really cute & easy!